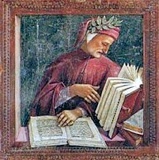 Luca d' Egidio di Ventura, known as Luca Signorelli, came from Cortona. According to Giorgio Vasari (whose great grandfather had been Signorelli’s uncle), Signorelli trained under Piero della Francesca. Vasari also recollected that Signorelli “lodged in the house of the Vasari [in Arezzo] when I ... was a little boy of eight years old, [and] I remember that the good old man, who was most gracious and courteous”. ✴the death of Moses, by which he probably meant one of the now-lost frescoes on the entrance wall. ✴he may have contributed figures in the scene of Christ giving the keys of Heaven to St Peter. Signorelli’s first important undisputed commission as an independent artist was the Sant' Onofrio Altarpiece (1484) in the Duomo Perugia (see below), by which time he was about 35 years old. He was granted citizenship of Città di Castello in 1488, and was the leading artist in the city for most of the 1490s (see below). Signorelli is best remembered for his cycle of frescoes (1500-4) depicting scenes from the Last Judgement in the Cappella Nuova of the Duomo of Orvieto (see below). 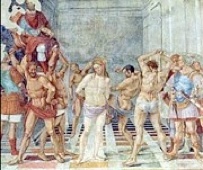 Having seen this work, Giorgio Vasari commented: “I do not marvel that the works of Luca were ever very highly extolled by Michelangelo, nor that in certain parts of his divine Judgement, which he made in the [Sistine Chapel, Michelangelo] should have deigned to avail himself in some measure of the inventions of Luca, ... as all may see”. Signorelli seems to have been badly affected by the death of his son, Antonio, during an epidemic of plague in 1502. It is also possible that the commission at Orvieto had exhausted his creative and emotional reserves. For whatever reason, he spent the last 20 years of his life as a provincial artist, mostly in his native Cortona. As noted above, Luca Signorelli was granted citizenship of Città di Castello in 1488. 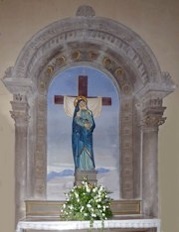 The relevant document reveald that he was, at that time, painting a processional banner for the “fraternitatis gloriose Virginis Marie”, a prominent Marian lay confraternity, but this work no longer survives. He was the leading artist in the city for most of the 1490s. He had a close relationship with the ruling Vitelli family. His departure from the city in ca. 1498 seems to created an opportunity for the young Raphael. This fragments of the figure of St Paul in the Pinacoteca Comunale is from a fresco of the Maestà with SS Paul and Jerome above the small entrance to the Torre Civico. According to Tom Henry (referenced in the page on the artist) a 15th century chronicle recorded its commission in 1474 for what was then the Torre del Vescovo. The date is significant, because this was the year in which Pope Sixtus IV drove Nicolò Vitelli from the city. The fresco was apparently in good condition until the earthquake of 1789. It was attributed to Luca Signorelli in 1832 (if not before), and this is generally accepted. If the attribution is indeed correct, it is among Signorelli’s earliest works. It suffered further damage when it was detached in 1935. (Judging from this illustration in Wikimedia, it has suffered yet further deterioration since). The will of Tommaso Brozzi records that he had indeed established this chapel in 1498, and the surviving frame bears his arms. The circumstantial evidence provided by the frame suggests that Tommaso Brozzi commissioned Signorelli’s altarpiece in ca. 1498. It was probably Signorelli’s last work in Città di Castello before he left for Orvieto. It remained in situ until at least 1856, and was transferred to the gallery in 1867. The frame of the Signorelli altarpiece had an almost identical pendant on the opposite side of the church that later housed the altarpiece (1502-3) of the Crucifixion with Saints (the Mond Crucifixion) by Raphael. Raphael clearly had the opportunity to study Signorelli’s altarpiece as he worked on his own commission in the church. Indeed, a sketch (ca. 1500) by Raphael of one of Signorelli’s figures (the archer to the right who faces away from the viewer) survives in the Ashmolean Museum, Oxford. The work is generally though to be from the workshop of Luca Signorelli. Following its restoration in 2011, Tom Henry (2012, referenced below) judged that the first side was indeed probably a workshop production, but that the second side was probably largely the work of Signorelli himself. This huge polyptych, which is attributed to Luca Signorelli and his workshop and dated on stylistic grounds, was recorded on the high altar of the original church of Monastero di Santa Cecilia in 1627. Agostino Tofanelli, the Director of the Musei Capitolini, Rome attempted to confiscate it in 1813, but it only made it as far as Perugia. The plan was then aborted, possibly because of the size of the work, and it was returned to Città di Castello. (The relevant research by Christina Galassi is referenced below). It was documented on the high altar of the nuns’ present church (see the page on Santa Cecilia in Paradiso) in 1832. It was transferred to the gallery in 1912. -SS Louis of Toulouse and Antony of Padua, on the right. •SS Cecilia (whom Christ crowns) and Clare stand to the sides. •SS Catherine of Alexandria and Elizabeth of Hungary kneel below. All of the saints except SS Francis, Antony of Padua and Clare are richly dressed. The sixth pilaster panel, which depicted St Michael, was stolen in 1986 and is replaced in the gallery by a monochrome copy. •St Tibertius (St Valerian’s brother). Payments were made in 1493 to Luca Signorelli for this altarpiece for the high altar of Santa Maria dei Servi (Santa Maria delle Grazie). It was in the sacristy in ca. 1726, when it was said to depict the Madonna and Child with SS Floridus, Peter, Paul and Amantius. Unfortunately, it no longer survives. In 1492, Baldo di Mariotto Lucarini made a bequest towards the cost of an altarpiece for the high altar of Sant’ Agostino that was apparently already being painted. The Commune and Camillo Vitelli also made contributions towards its cost. Luca Signorelli received payments for it in 1493-4: the final instalment was in the form of vineyard, which Signorelli immediately sold. The Vitelli family probably influenced the choice of subject of the altarpiece: like the Medici and the Baglioni families, they probably identified the theme with princely patronage. 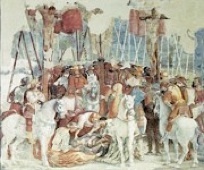 The figure in a red hat and on horseback at the top right has been variously identified as Camillo, Paolo or Vitellozo Vitelli. The altarpiece was documented on the high altar of Sant’ Agostino in 1627. This altar and its altarpiece were sold to Pope Pius VI after the earthquake of 1789. The Emperor Napoleon III acquired its main panel in the sale of the collection of the disgraced Roman collector, Giovanni Pietro Campana in 1861, and it is now in the Musée du Louvre, Paris. A panel of the Annunciation in the Philadelphia Museum of Art might have originally belonged to its predella. This altarpiece was documented in 1627 on the altar of the Cappella della Natività in the nave of Sant’ Agostino, with an attribution to Luca Signorelli. Francesco Feriani, who endowed the chapel in 1493, probably also commissioned the altarpiece at about that time. Pope Pius VI authorised its sale after the after the earthquake of 1789. It is usually identified with this painting that was in a Roman collection in 1802 and that is now in the Museo di Capodimonte, Naples. Tom Henry (2012, referenced below) has dated them on stylistic grounds to the 1490s, in which case the portrait of Nicolò Vitelli (died 1486) was posthumous. There are 19th century copies of all three of these portraits in the Pinacoteca Comunale. 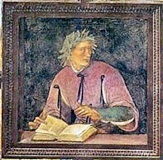 A similar copy there, of a portrait of Paolo Vitello (another of Nicolò’s sons), could relate to a lost original by Signorelli. The Tiburti family probably commissioned this altarpiece, which is signed by Luca Signorelli, for their Cappella della Natività (now lost) on the right wall of San Francesco. Early sources provide the date, 1496, which might have been inscribed on the frame. Giorgio Vasari referred to “a Nativity of Christ in San Francesco, [Città di Castello]” in his entries on Luca Signorelli in both editions of the “Lives of the Artists” (1550 and 1568): a gloss in the earlier edition said that it had been painted “con disegno et amore” (with good draughtsmanship and love). It was documented on the altar in question in the 1720s but was in the refectory by 1810. It was subsequently sold to a local family and is now in the National Gallery, London. In his account of the work of Luca Signorelli, Giorgio Vasari recorded: “In Perugia, he made many works; among others, a panel in the Duomo for Messer Jacopo Vagnucci of Cortona, Bishop of that city, in which panel are Our Lady and SS Humphrey (Onofrio in Italian), Herculanus, John the Baptist and Stephen, with a most beautiful angel who is tuning a lute. The attribution to Luca Signorelli of this panel from the the Cappella di Sant' Onofrio has never been doubted. It is almost certainly associated with a now-lost inscription that was dated 1484, which established the fact that Bishop Jacopo Vagnucci had founded the chapel and that his successor and nephew, Bishop Dionisio Vagnucci had been responsible for its decoration. The date of 1484 fits in with the known movements of Signorelli and with his style at that time. It thus seems that this panel is among the earliest of his securely attributed works. The altarpiece depicts the Madonna and Child with SS Humphrey ( dressed as an unkempt hermit), John the Baptist and Laurence and an unidentified bishop. This last figure is probably St Herculanus, who is perhaps portrayed using a portrait of Jacopo Vagnucci. (This figure does not have a halo. but a drawing in the British Museum on which it seems to have been based does). During a recent restoration, traces of what seems to have been an imposing wooden frame were uncovered. The form of this frame is unknown, but it could have also included a predella. A small panel in the Louvre, Paris, which is attributed to Signorelli and depicts the birth and naming of St John the Baptist might have belonged to it. It is also possible that the inscription mentioned above was at its centre. When this chapel was destroyed 1608, the altarpiece was moved a series of other locations in the Duomo: it was, for example, documented near the sacristy in 1674. It became the major exhibit in the newly instituted Museo Capitolare in 1923. ✴the Virgin and the Apostles. ✴Pietro Antonio Monaldeschi, in 1495. 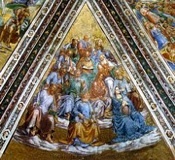 In early 1500, as work on the vaults of the chapel was nearing completion, Signorelli submitted his plans for its walls to the Opera del Duomo. These were duly accepted, albeit not unanimously, and Signorelli was commissioned to carry out the work. Giovanna Monaldeschi made a modest donation to the project from the estate of her husband, Pietro Antonio Monaldeschi. Although the subject of the wall frescoes was clearly predetermined when Fra’ Angelico frescoed Christ in judgment above the altar, it was made more poignant by the plague that ravaged Orvieto at the start of the new century. Luca Signorelli dramatically captured the millennial fervour that gripped the city, and the result was his masterpiece. Giorgio Vasari (who was related to Luca Signorelli and had childhood memories of him as an old man) recorded that Signorelli: “painted all the scenes of the end of the world with bizarre and fantastic invention: angels, demons, ruins, earthquakes, fires, miracles of the Antichrist, and many other similar things besides, such as nudes, foreshortenings, and many beautiful figures; capturing the terror that there shall be on that last and awful day. ... 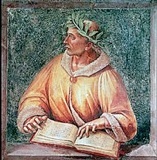 I do not marvel that the works of Luca were ever very highly extolled by Michelangelo, nor that in certain parts of his Divine Judgement, which he made in the [Sistine Chapel, Michelangelo] should have deigned to avail himself in some measure of the inventions of Luca, ... as all may see”. •To the left of the entrance, the dead arise to face judgment. •On the altar wall, immediately below Fra’ Angelico’s Christ in Judgement, the elect are assembled to His right while the damned are herded to His left. •In the next lunette on the left wall, the elect reach paradise. •In the next lunette on the right wall, the damned pass through purgatory into hell. ✴Dante, surrounded by four grisaille scenes from the Purgatorio (part of the Divine Comedy). The entrance wall contains an expertly foreshortened figure of an unidentified youth. The contract between the Opera del Duomo and Luca Signorelli of 1500 included the redecoration of the Cappellina dei Corpi Santi, which hosed the relics of St Faustinus and St Peter Parenzo. Payment for the building of a wall in front of the existing fresco is recorded in 1502-3. The new fresco, which was executed on this wall, depicts the Virgin's lamentation over the Dead Christ with SS Mary Magdalen, Faustinus and Peter Parenzo. The scene is set in front of a sarcophagus that contains a fictive relief of the Deposition of Christ. Scenes of the martyrdoms of St Faustinus and St Peter Parenzo are depicted in tondi in the shallow sidewalls of the chapel. 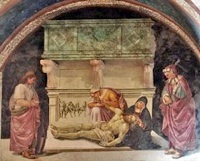 The cartoon for the figure of the dead Christ was probably first used in Signorelli’s altarpiece of the Lamentation (1502), which he painted for the high altar of Santa Margherita, Cortona (now in the Diocesan Museum, Cortona, Illustrated here). Signorelli’s extended visit to Cortona at this time occurred because his family home was struck by plague, resulting in the death of his son, Antonio. The altarpiece probably reflected the tragedy: Giorgio Vasari recorded: “It is said that a son of his, most beautiful in countenance and in person, whom he loved dearly, was killed at Cortona; and that Luca, heart-broken as he was, had him stripped naked, and with the greatest firmness of soul, without lamenting or shedding a tear, portrayed him”. In May 1504, shortly after St Mary Magdalene had been adopted as a patron saint of Orvieto, the Opera del Duomo decided to commission an altarpiece depicting her. Two months later, it was decided that this would be placed in what became the Cappellina di Santa Maria Maddalena. 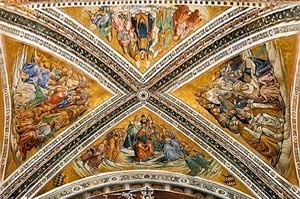 It was removed when the chapel was remodelled in 1653 and is now in the Museo dell' Opera del Duomo. This altarpiece, which is by Luca Signorelli, depicts St Mary Magdalene standing in a landscape. It is painted on wood and might have been originally conceived as a processional banner. The inscription along the bottom of the panel records that the Conservatori della Pace (the elected officials who were charged with maintaining peace between the city’s factions) commissioned the work, which was dedicated to “she who keeps the peace”, and gives the date 1504. The lintel of the frame bears the names of two of the commissioning magistrates, “CECCARELLUS DE ADVIDVTIS ET RVFINVS ANTONII, together with their arms and those of the Commune. 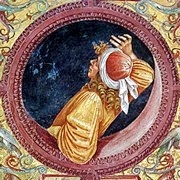 This painting in tempera on terracotta is in the Museo dell' Opera del Duomo. It has an inscription on the reverse that commemorates the two protagonists of the decoration of the Cappella Nuova in the Duomo: Luca Signorelli and Nicolò d' Agnolo Franchi, the treasurer of the Opera del Duomo. The figure to the left is sometimes attributed to Luca Signorelli himself. However, other scholars maintain that the painting is an 18th century forgery. Recent scientific analysis has revealed that at least the terracotta base dates to the 16th century. See also this fabulous on-line resource for documents on Luca Signorelli, which is the work of Dr. Tom Henry. Return to Art in:: Città di Castello Orvieto Perugia.